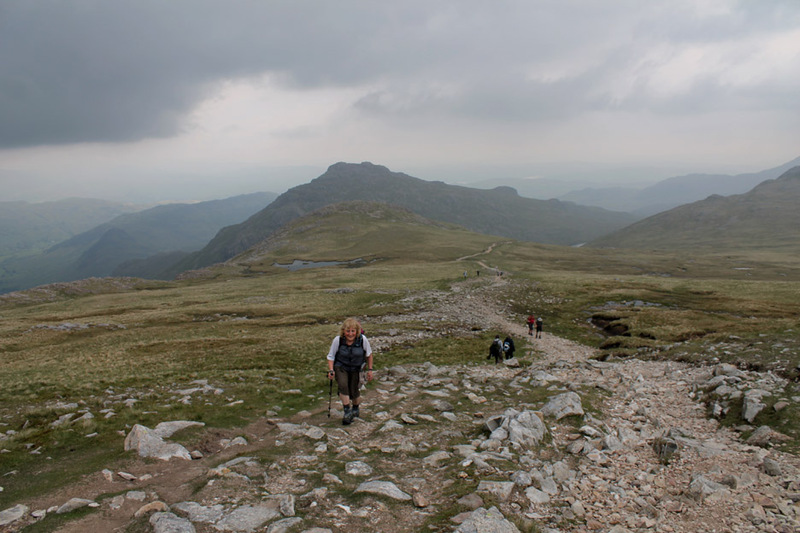 " Cold Pike and Crinkle Crags "
Date & start time: Sunday 9th June 2013, 11 am start. 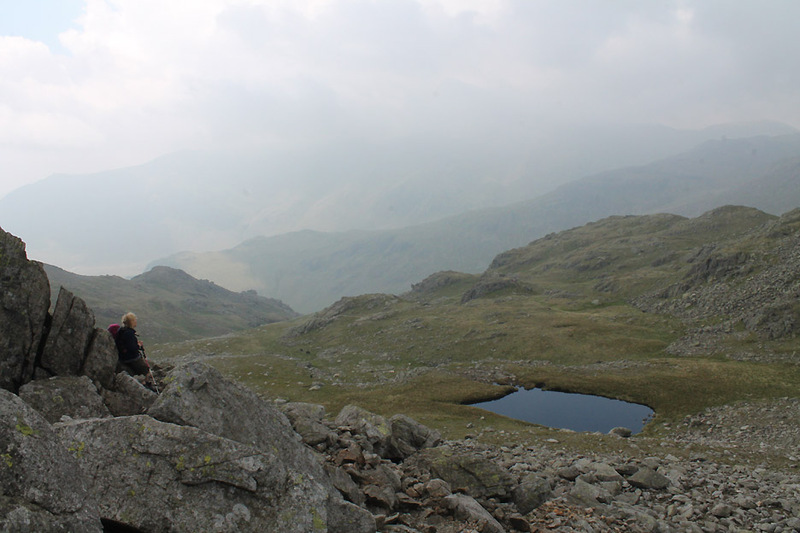 Places visited : Cold Pike, the Five Crinkles, Shelter Crags and back via Red Tarn. 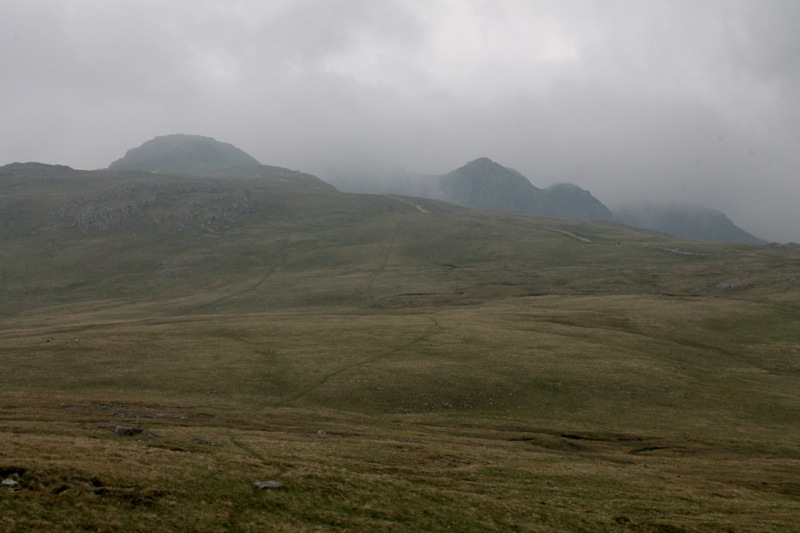 Walk details : 7 mls, 2500 ft of ascent, 6 hours. Weather : Overcast and cloudy but forecast as potentially clearing. 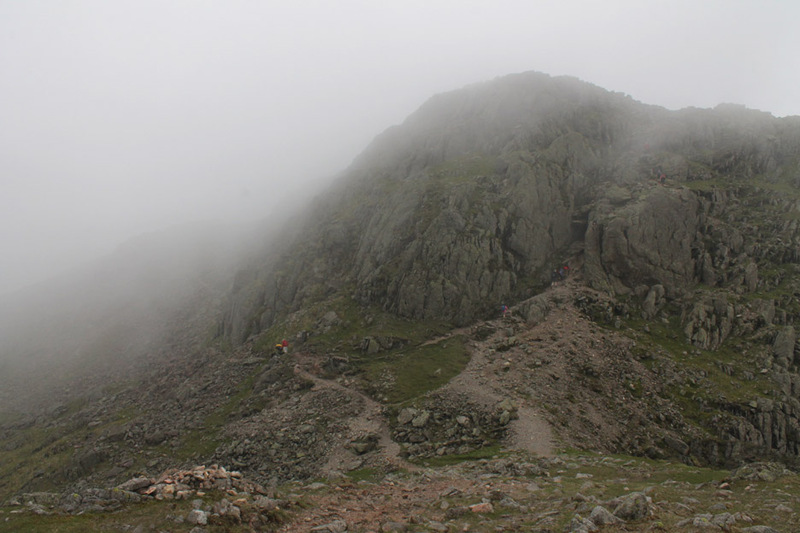 and an initial climb up Cold Pike seemed a nice way to vary the out-and-back route. Cold Pike on a warm day. It has the potential to be a rocky track today so Harry has his protective sock on . . . best gortex of course ! 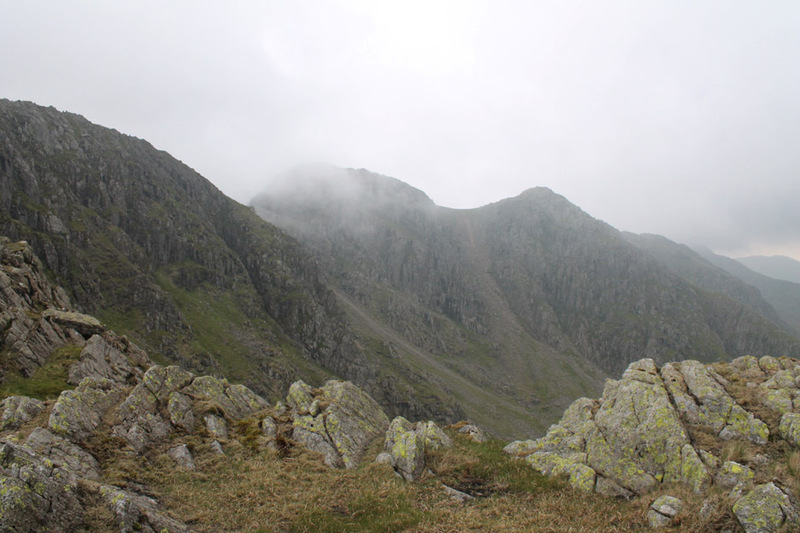 the bulk of Wetherlam starts to show above the descriptively named Wet Side Edge. To our right as we look back, the Wrynose Pass descends to Wrynose Bottom and heads down the Duddon Valley past Harter Fell. At Cockley Beck Bridge it splits and the mountain road rises again, over the Hard Knott Pass, the steepest road in Lakeland. 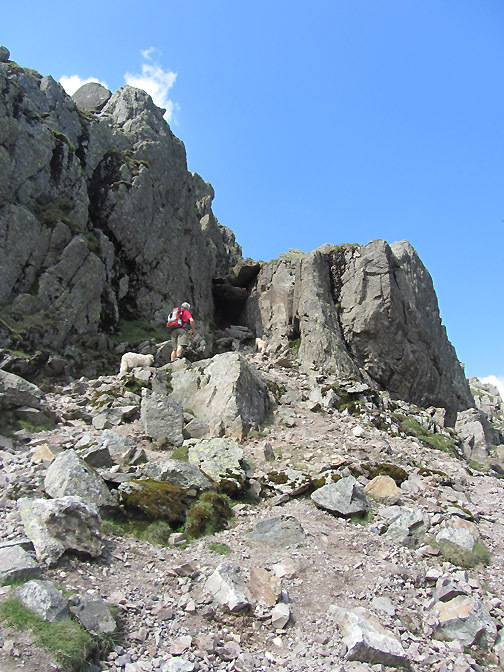 Our virtually pathless route also increases in steepness as we neared the summit of Cold Pike. 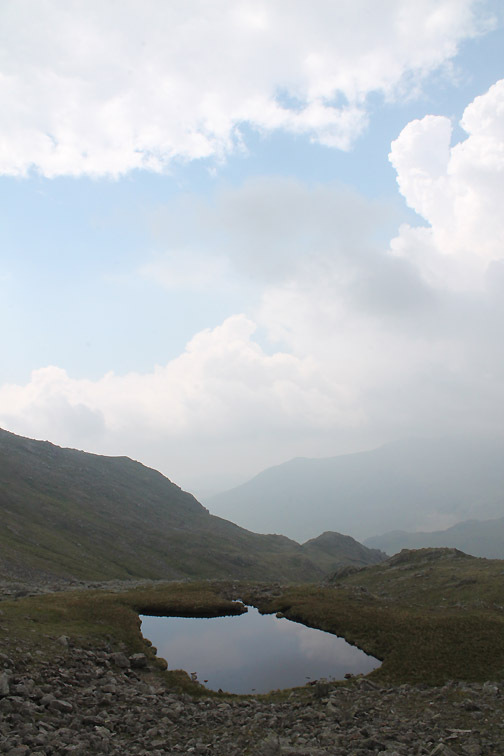 Below us now the waters of Red Tarn looked decidedly black not red . . reflecting the mood of the sky. Still the breeze is warm and it's shorts and (icebreaker) t-shirt weather here at the top of the Pike. 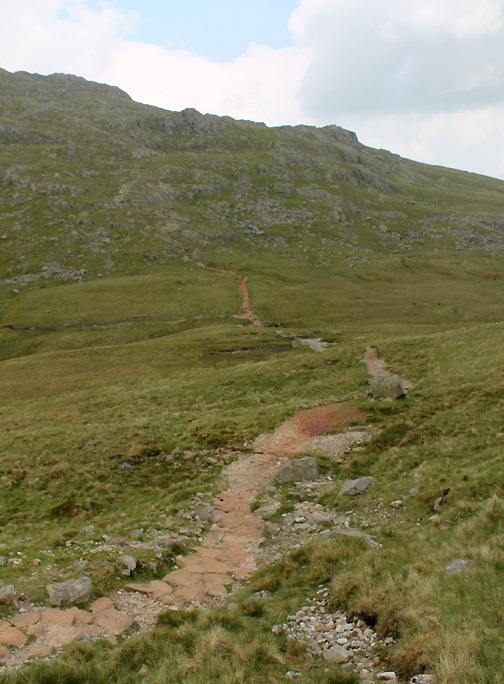 A choice of two paths to walk across the flatter ground towards Crinkle Crags. 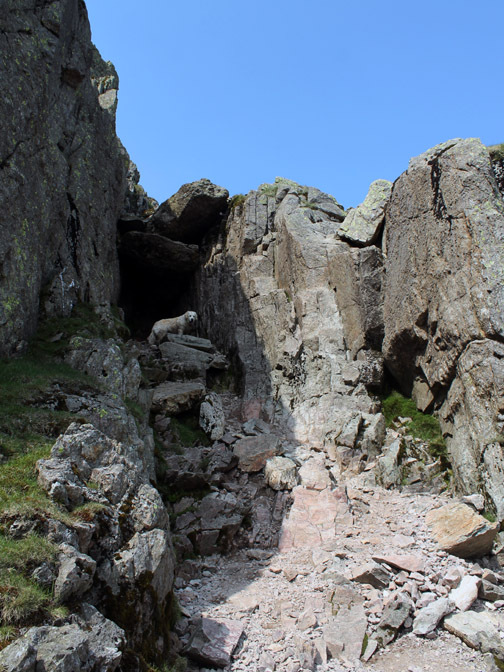 These paths are probably only frequented by sheep and the occasional fell walker aiming to climb another of the 214 AW peaks. 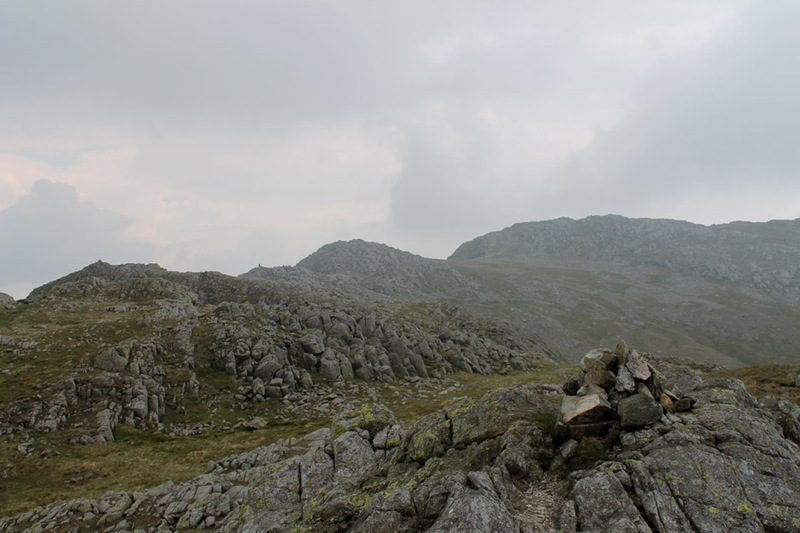 The mid-grey clouds in the background are in fact the landscape of the Helvellyn fells. 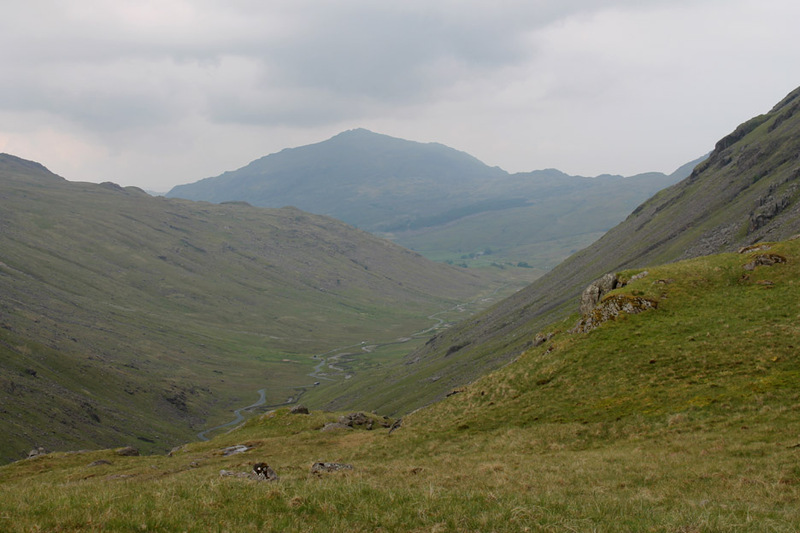 The gap will be Raise Beck leading up to Seat Sandal with St Sunday Crags and Fairfield to the right. 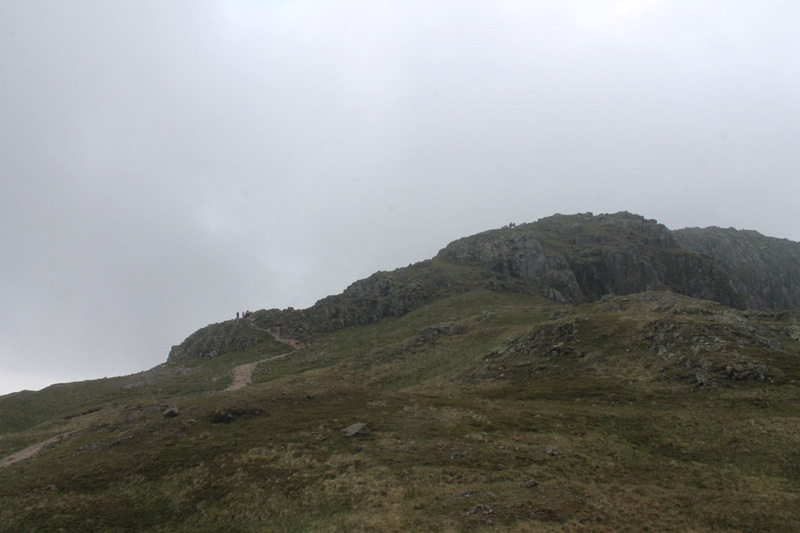 We join the wide path that will take us on towards Crinkle Crags. The cloud comes and goes as we make our way up. 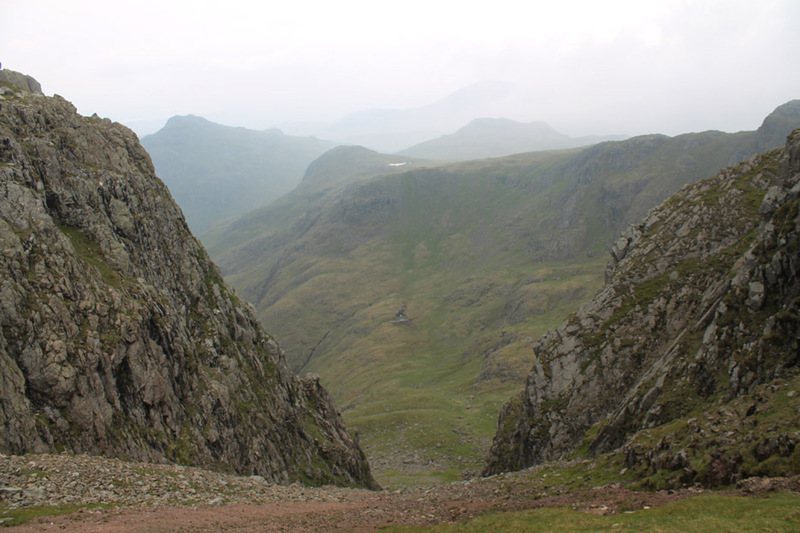 The second Crinkle (from the south) and central to this picture is the highest of the five. There are several groups of people ahead of us . . . and some of them are standing directly on the skyline. Mmm . . . one for the record as they say . 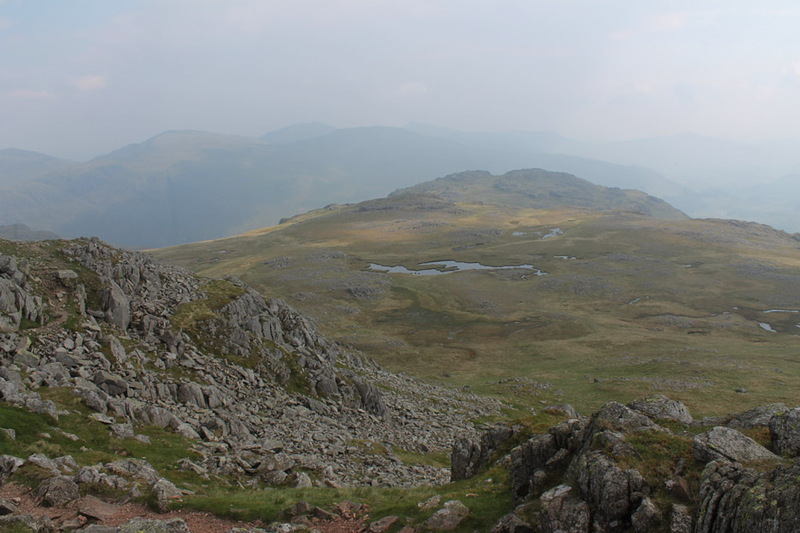 . . this was the view down into Eskdale from the first Crinkle summit cairn. It was so dark under the cloud that the camera's flash kicked in for this one. 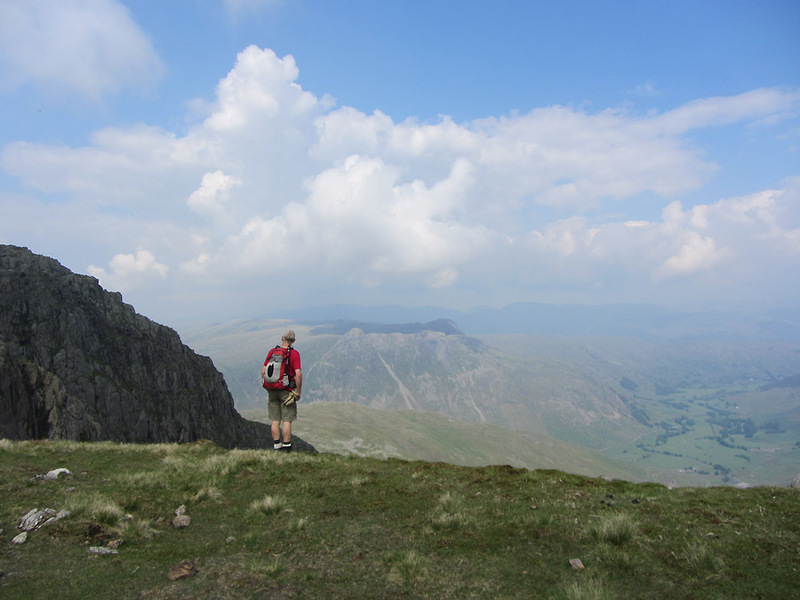 On the opposite side, the view down into Langdale is only slightly better. However, the clouds do introduce their own form of beauty at times. 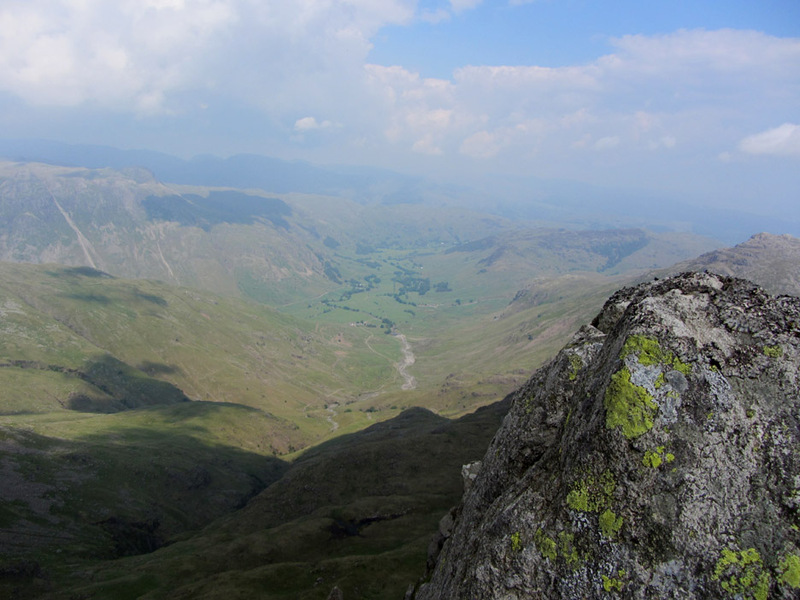 From the first Crinkle summit we look across to the second . . . and get a view of the "Bad Step" climb. had been blocked by an overhanging boulder stuck in the narrow grove. 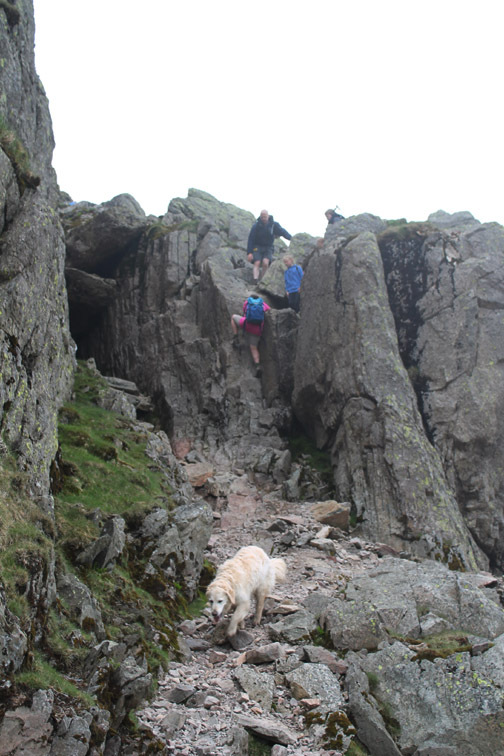 to help them up the scramble. than Ann (her words) to enable me to help the dogs up and over. climbed directly up but the "life on the edge" situation looked interesting. The group ahead of us makes for the gully . . .
. . . and climb it successfully. 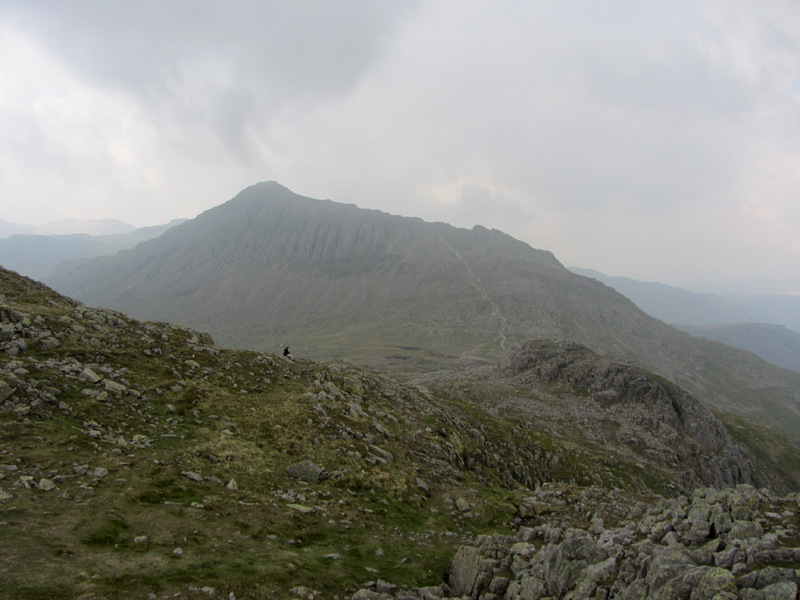 which skirts under the summit crags and climbs up the side of the fell. 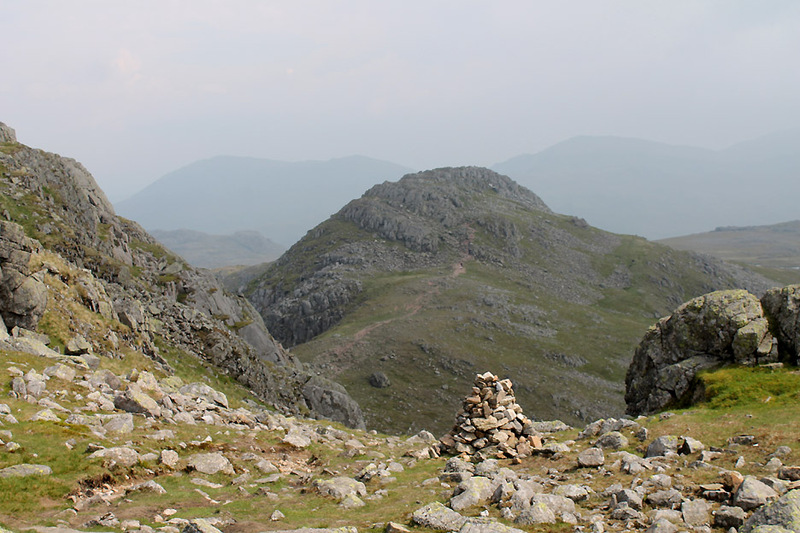 The top cairn on the highest Crinkle is camouflaged by the sheer number of similar rocks and boulders that scatter the summit area. 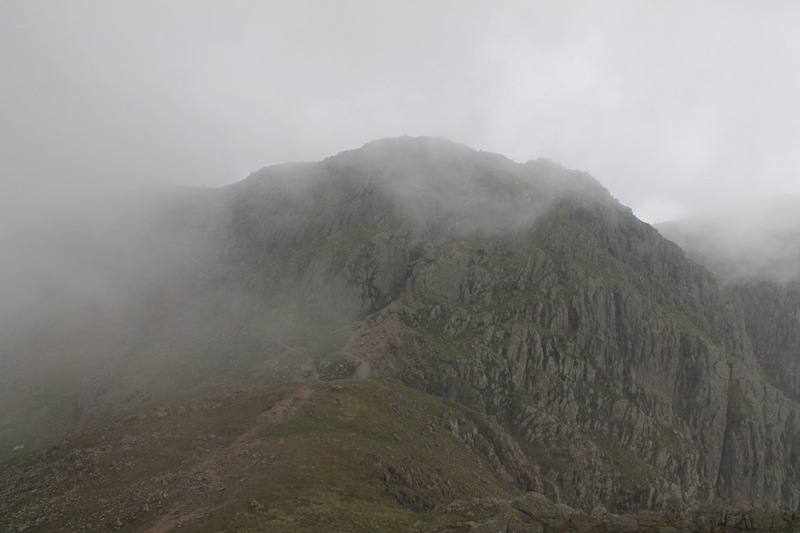 The cloud up here is intermittent and the other peaks were not always in view. 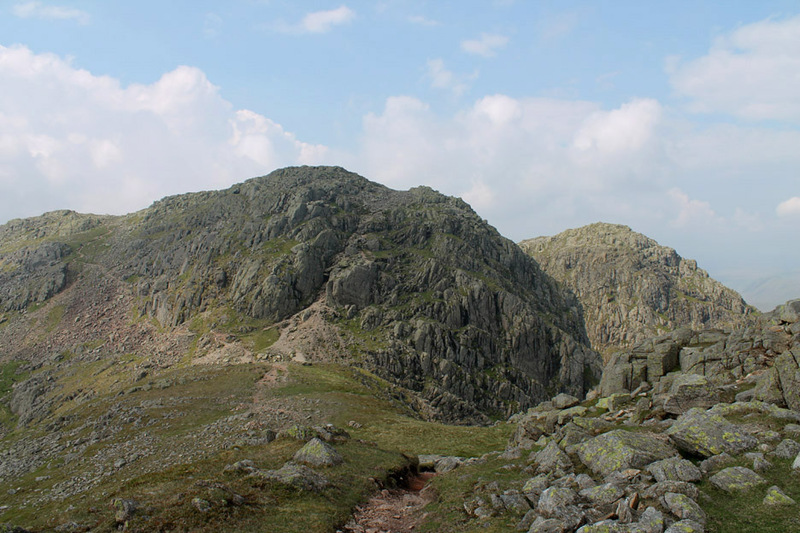 the remaining three Crinkle summits . . . from just a little further on. Looking down Mickle Door and across to Great Knott . . . the white is not snow but a small tarn we would visit later. 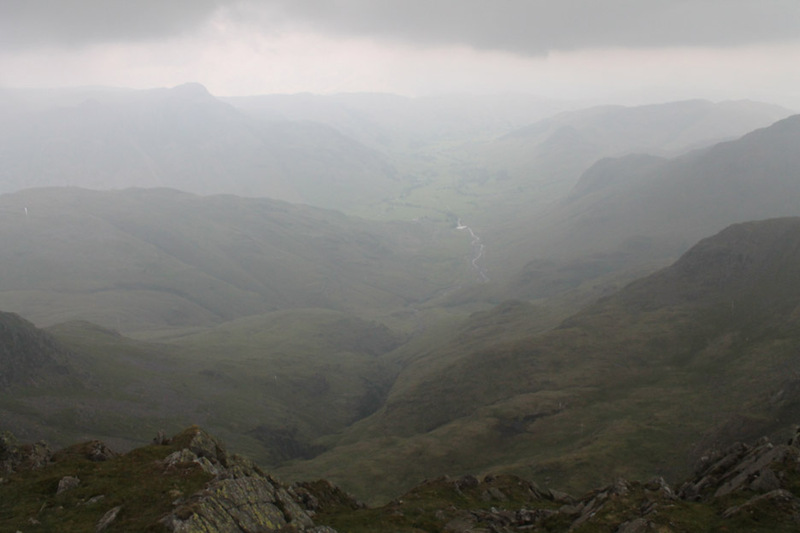 Great Cove below is the source of Crinkle Gill which flows out of the Oxendale Valley and on through Langdale. 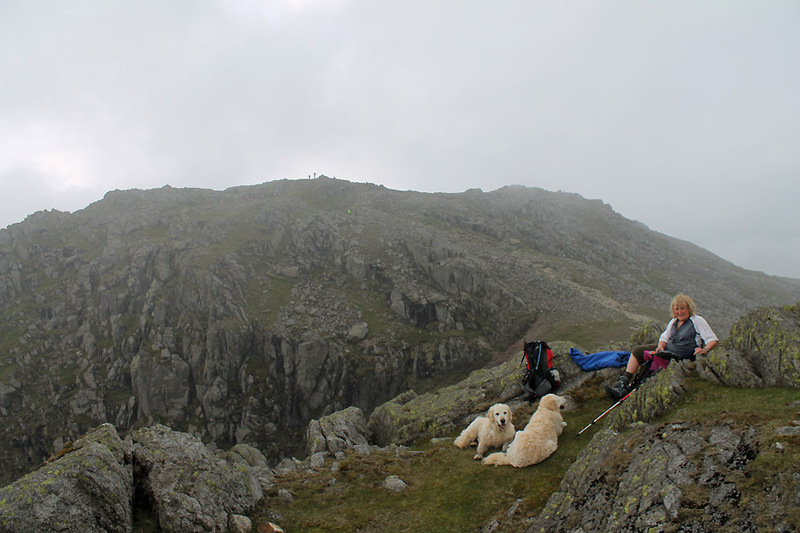 Time for a spot of lunch on the third Crinkle . . . Gunson Knott. There was a brief discussion as to correct numbering from north or south . . . In practice of course the middle of five is always number three . . . which ever direction you start from ! 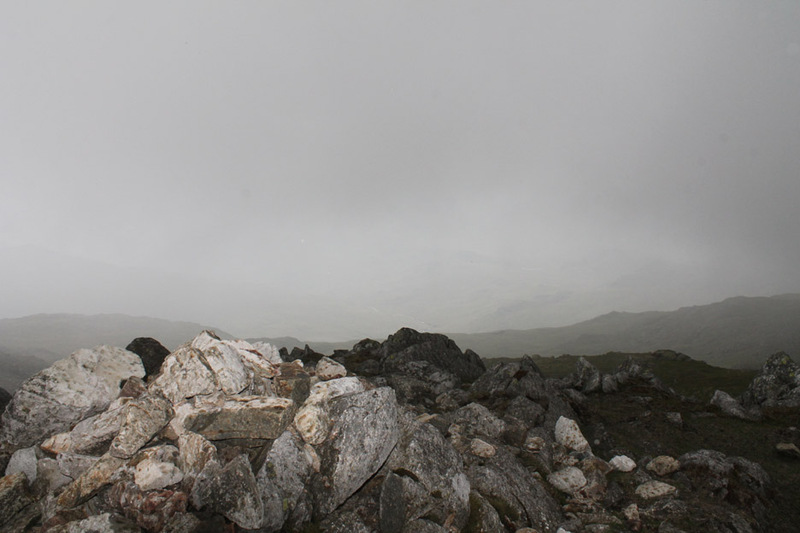 Number four summit cairn and now the sun is starting to break through . 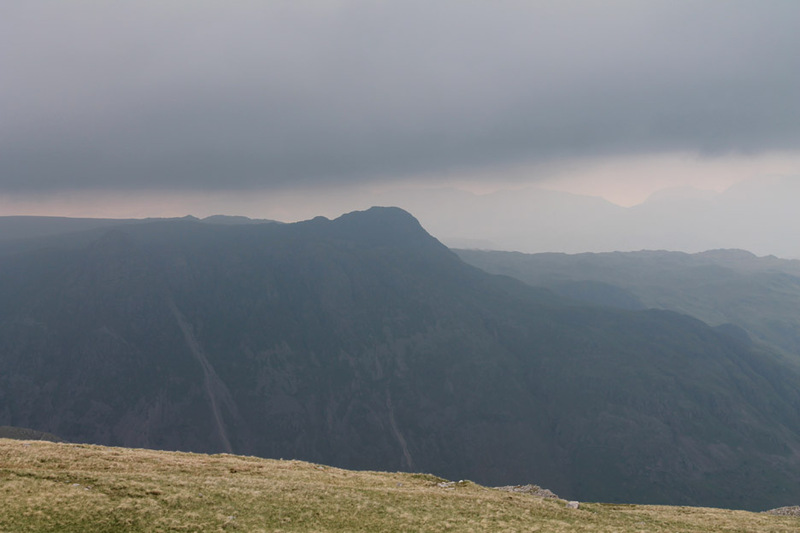 . . lighting up the rocks on Bowfell in the distance. 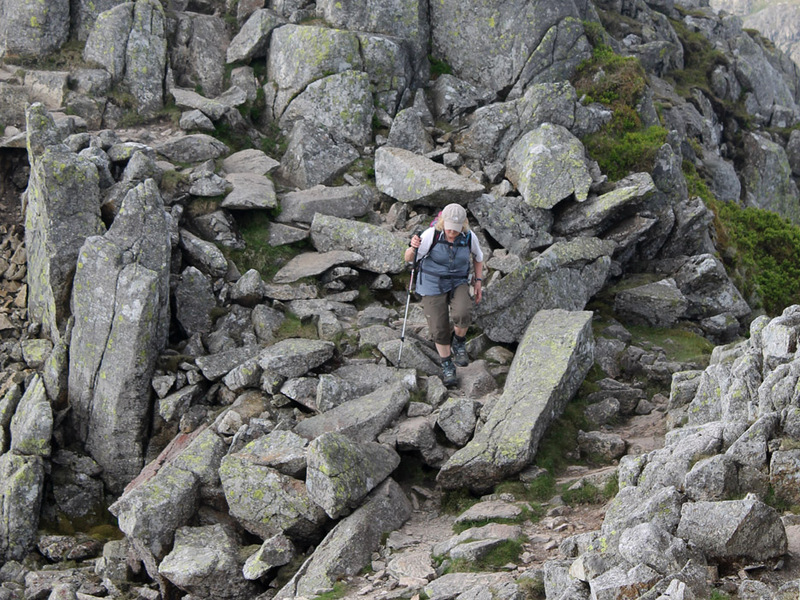 Ann pauses as we descend the rocks to the tarn that will lead us on to the fourth summit. 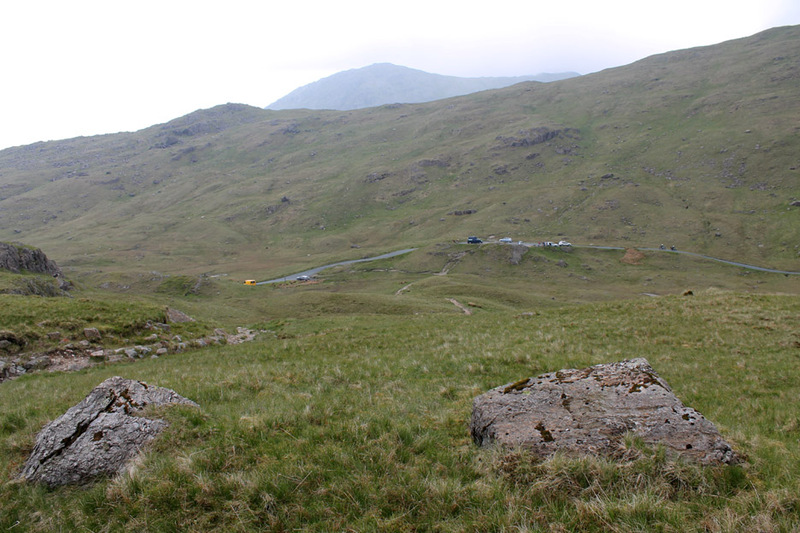 The cairns highlights an indestinct route through the rocks. Blue skies really brighten the day. One of several small tarns along the ridge . . . the reflections were nice. 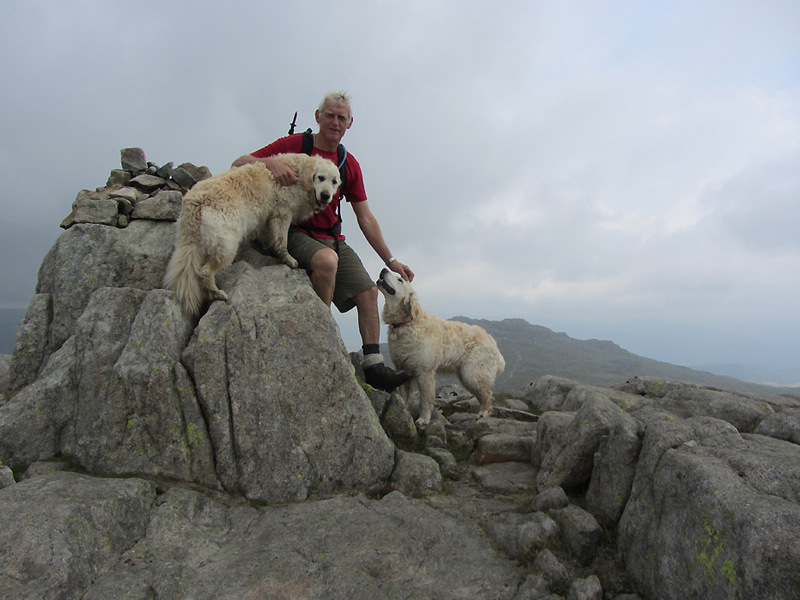 After completing the five tops it is always an arbitrary decision where and when to turn round. 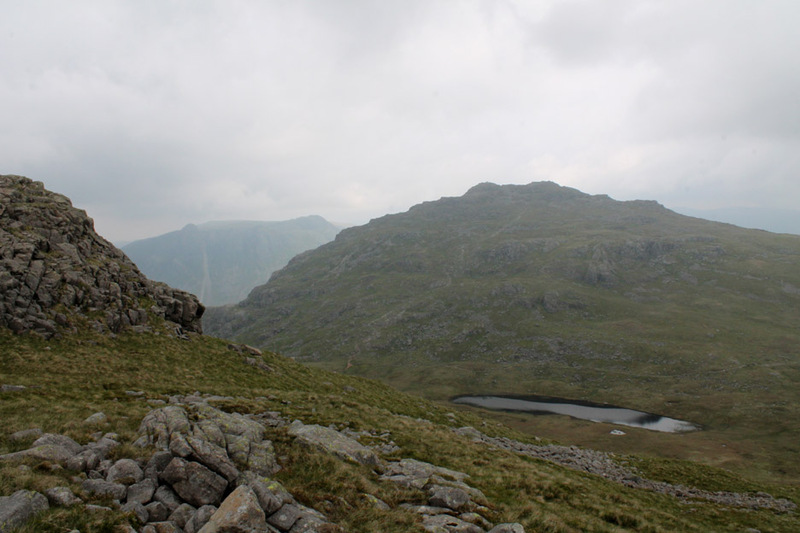 That lower summit with a nice view of Three Tarns seemed like a good place to end on. In no time at all you are transported there . . . I took us a little longer as we had to walk ! There's a great view from here. Time to turn round and do it all again. 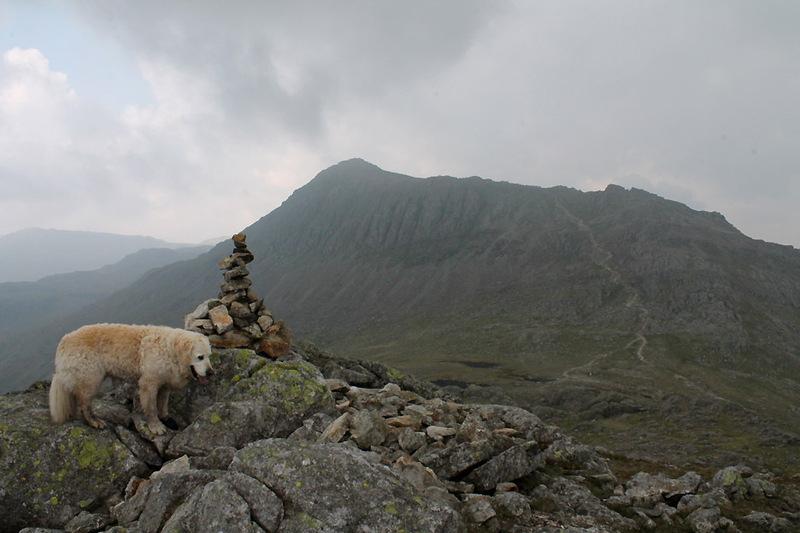 made even easier by missing out on the final scramble to each of the cairns that we had visited on the way out. Back down the side path to avoid the "Bad Step" . 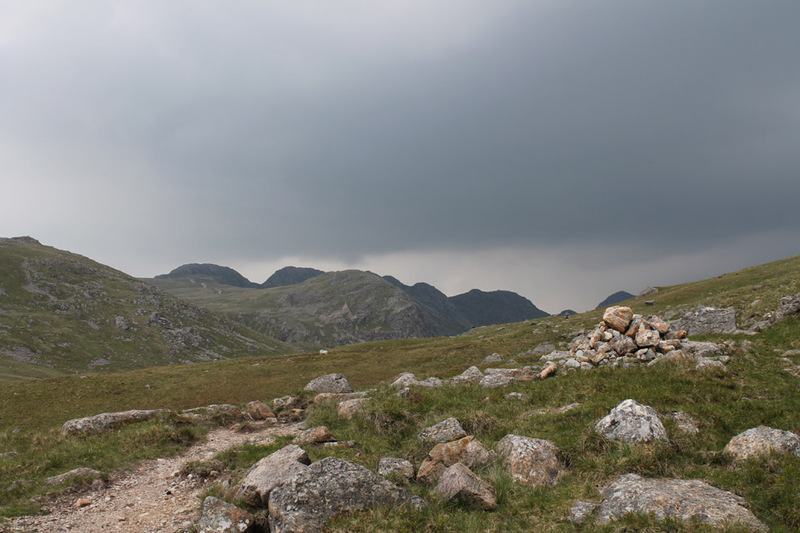 . . the cairn guides you along the way. This is a colour version of that black and white photo of Langdale we took on the way out. I diverted slightly to the base of the scramble . . .
. . . Bethan went up to investigate the potential of the climb. The view was now worth stopping to enjoy. 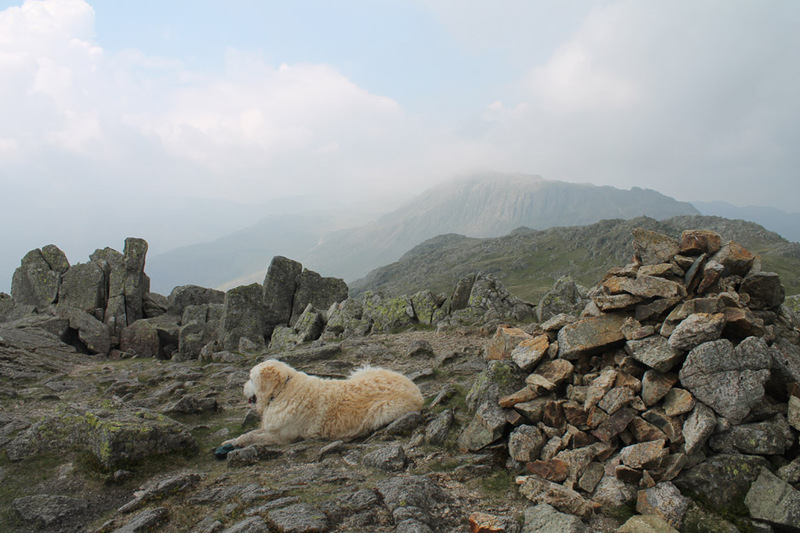 Looking back at the summit crags . . . now they were completely cloud-free. 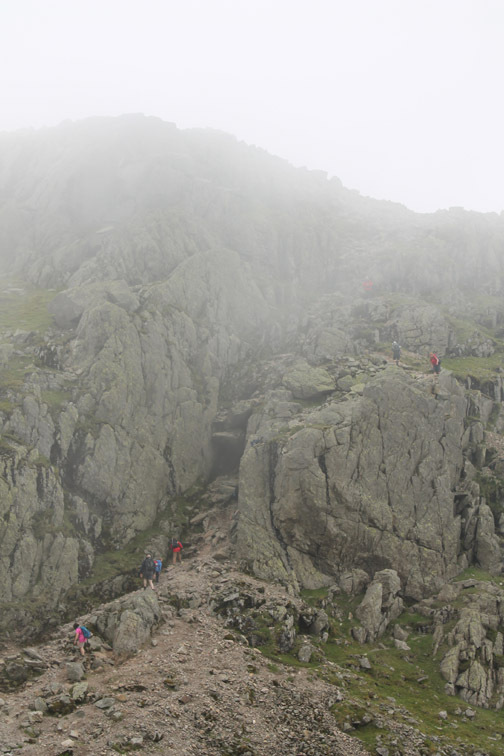 We were even honoured with a few "passing cloud shadows" to enhance the fell side below. 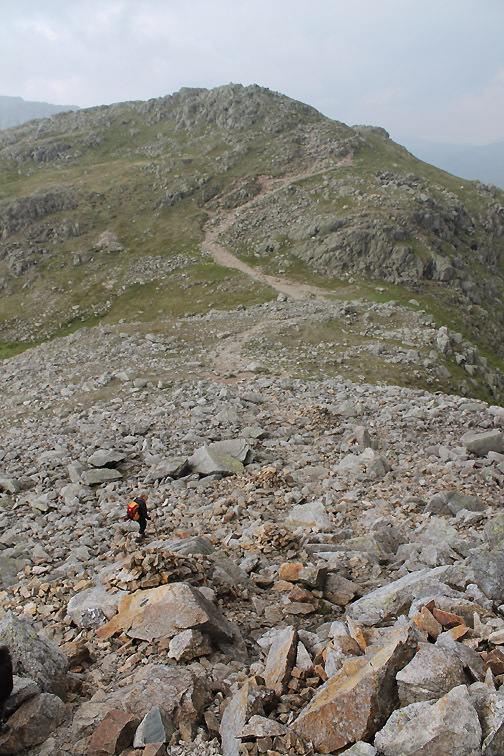 The last of the boulder fields takes us over to the initial summit once more. 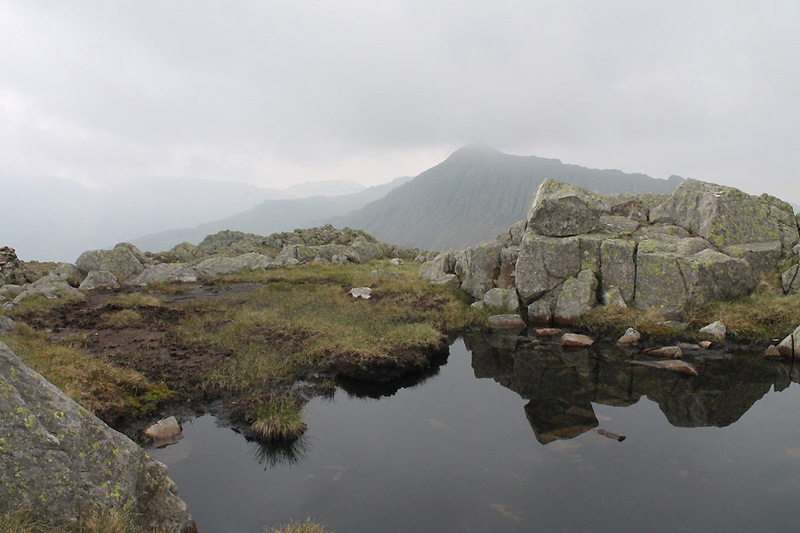 we look down on the small tarns that lead the eye out onto Little Stand. 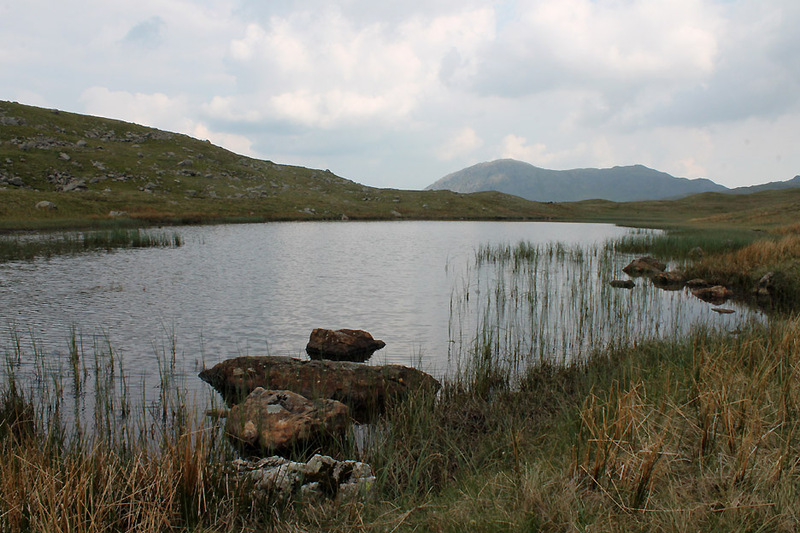 The tarns at Great Knott . 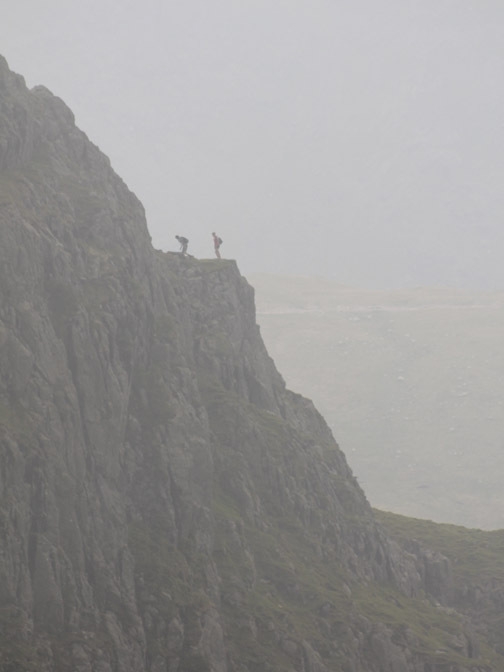 . . reflecting the five (or so) peaks that make up the high ridge walk of Crinkle Crags. A slightly wider view . 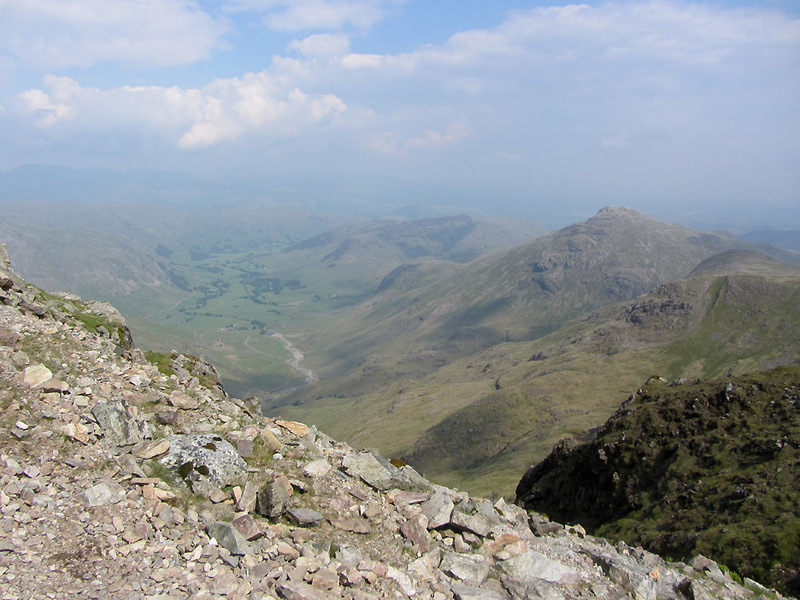 . . now that the sun is also shining on Bowfell at the end. 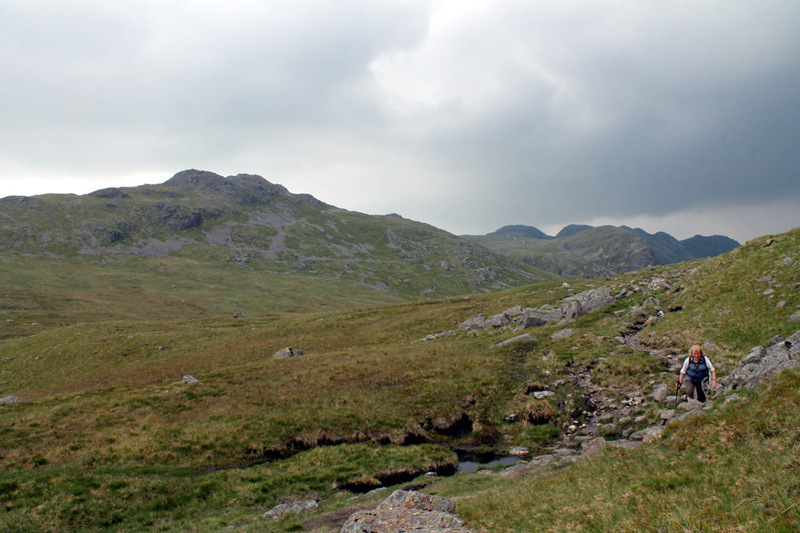 Ahead, Red Tarn nestles between Pike O'Blisco on the left and Cold Pike on the right that we climbed on the way up. Red Tarn so called because of the iron content of the soil . . .
. . . but a small 1860's mineral exploration came to nothing. 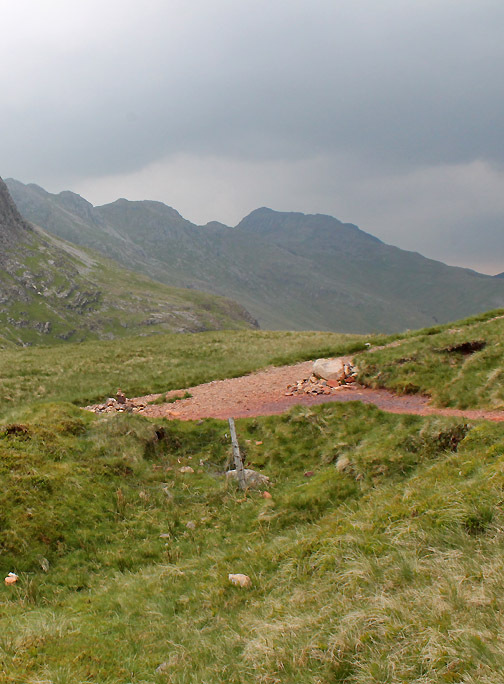 The clear waters of Red Tarn looking south. We leave the coll behind and start our descent . . . passing a few sheep on the way . . . 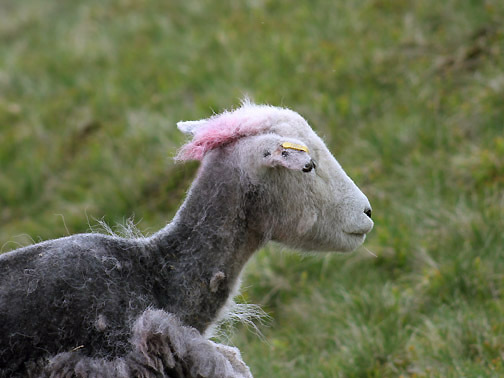 They were undergoing a natural summer moult . 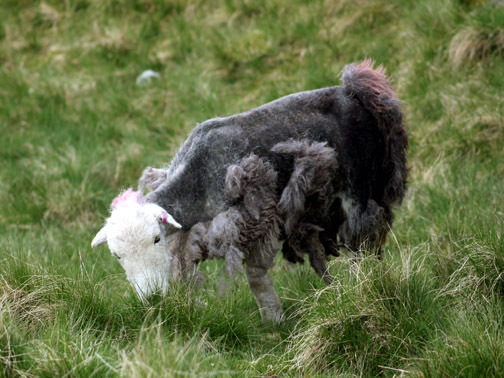 . .
which left this one with a delightful, pink quiff of hair. Not far now . 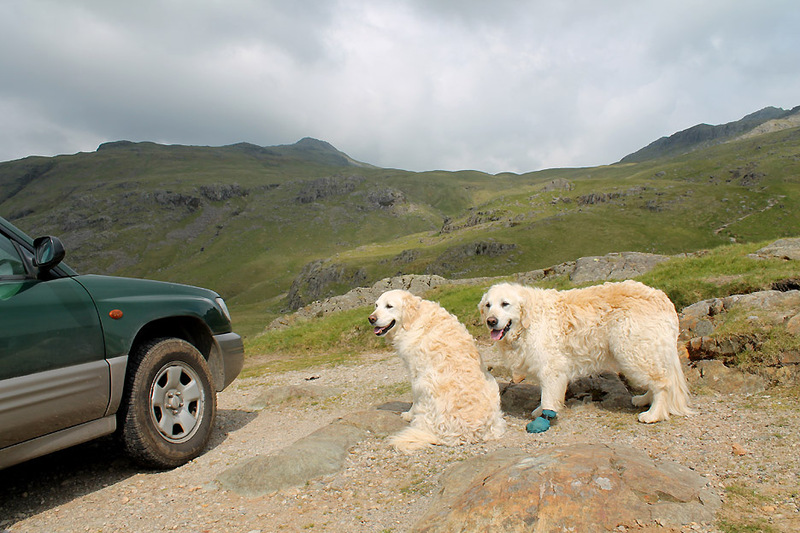 . . back to the Three Shires Stone and our car waiting to be driven home. 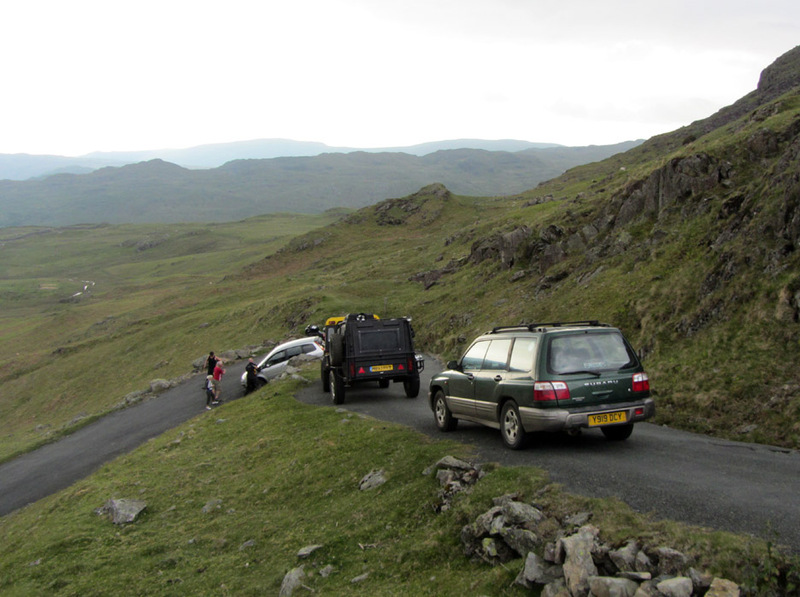 One the way over Hard Knott we stopped to help extricate a car on one of the sharp bends. The driver had cut the corner too sharply and got stuck on a rock. 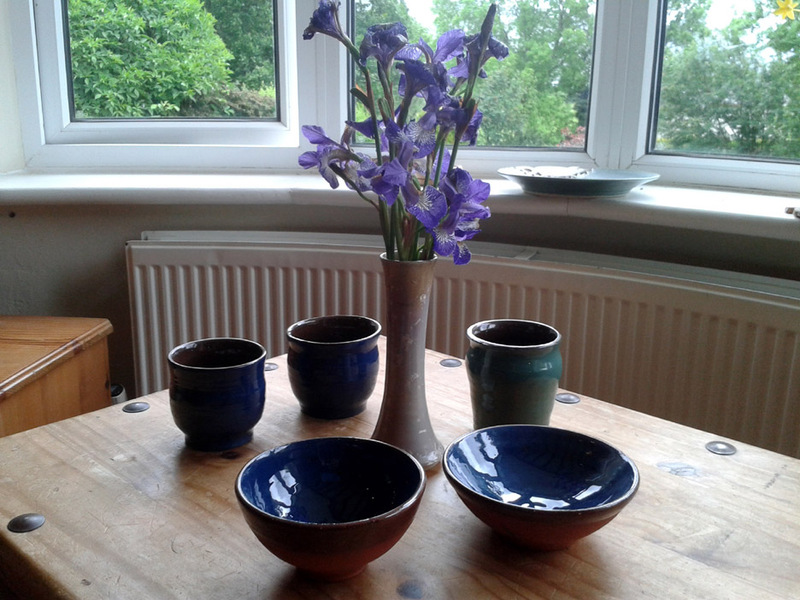 Our route home took us past the Gosforth Pottery that I visited recently and where I enjoyed a few pottery lessons. The product of my labours have been glazed and now have pride of place at home . . . pass the jar of cereal and a spoon please. This site best viewed with . . . seven books . . . with one mountain page left open in the last one.